Every day people comparison shop online for things like electronics, clothes, household products, and more, so why not event tickets? 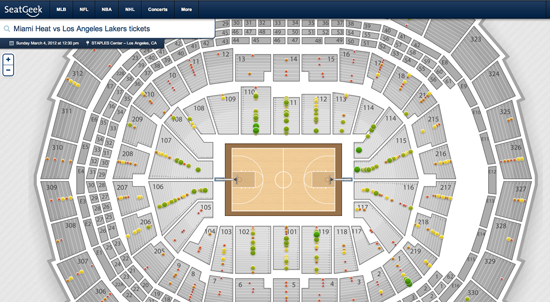 Our goal at SeatGeek is to build a web app that helps fans quickly and easily find the best seats at the best price. When we launched SeatGeek in September ’09, there were two primary means by which our site helped users find good deals: (1) meta-search and (2) price forecasting. Our meta-search aggregates seats from dozens of brokers and over 10,000+ events, and our forecasting technology has saved thousands of fans money by informing them of the best time to buy. We recently added a third major money-saving feature: Deal Score™. SeatGeek’s Deal Score is a number from 0 to 100 that is assigned to each ticket listing indicating whether or not the listing is good deal based on its price, location within the venue, and the number of tickets in the listing. How is Deal Score useful? I like to explain it by making a comparison to shopping for an airline flight. If I’m looking at options for a flight, I can identify good deals by just sorting by price. The cheapest tickets are bargains, the most expensive tickets are rip offs. I may have to make some subtle adjustments to account for layovers or takeoff times but, fundamentally, price is an acceptable arbiter of value. That isn’t the case with event tickets. If I’m looking for Lakers/Heat tickets and I sort by price, the least expensive tickets are probably not the best deals, they’re probably just seats that are right below the rafters. That’s because seat location is critical. A user comparing a long list of event tickets cannot effectively shop based on price alone; she needs a metric that also takes into account seat location. Deal Score fills this void. A $100 courtside ticket will likely have a higher Deal Score than a $90 ticket in the upper deck, even though the courtside ticket is more expensive. Tickets with a Deal Score of 100 are the absolute best value for that event; tickets with a Deal Score of 0 are the worst. How is Deal Score calculated? SeatGeek assigns an “expected” price to every row in every venue. This expected price is based on a number of factors, including long-term historical prices for each section, the row location with respect to other rows/sections, the the distance to the field, and the angle to the field. Then, for each ticket listing, we compare the actual price to the expected price and look at the deviation as a percentage of the expected price. We apply several adjustments to account for nonrandom variance. The Deal Scores are then assigned by attaching the deviations to an appropriate distribution. 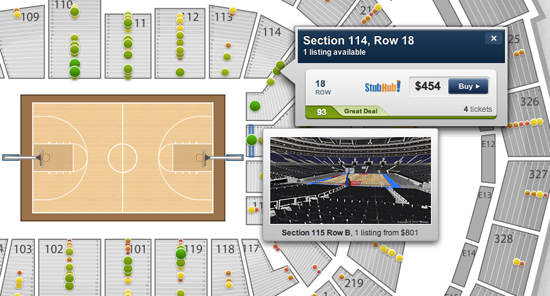 In addition to seat location, Deal Score also takes into account the number of tickets in a listing. Listings on the secondary market can offer anywhere from one to over twenty tickets. For the most part, people don’t like to go to events alone, so buying a single ticket is inconvenient. Therefore, a single-ticket listing will, on average, sell for less per ticket than a two-ticket listing, assuming both listings are in the same location and are for the same event. We have identified the discount/premium associated with every quantity of tickets, and we include this in Deal Score as well. In other words, we do a bunch of math behind the scenes that you’ll never have to worry about. When it comes to buying tickets, we’re aiming to build the most efficient way for fans to get the greatest deals out there. We’d love to hear what you think about our search, forecasting, interactive seating maps, and Deal Score and how you think we can improve our site to make your experience even better. Let us know in the comments, in the Feedback tab throughout our site, or on Twitter @SeatGeek.